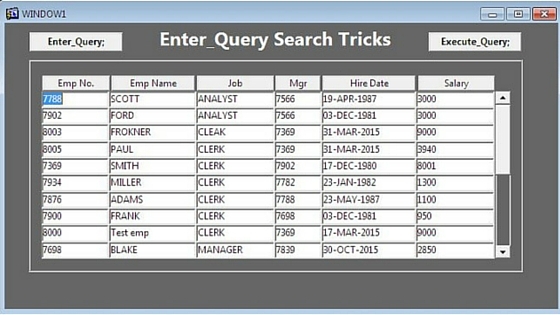 In this post you will learn how to specify any condition in enter query mode of Oracle Forms. Whenever Enter_Query command executes Oracle Forms comes into enter query mode and in that mode you can specify some criteria to filter the records and after that when you execute query using Execute_Query command then the records would be fetched based on that condition you specified. The below is the screen shot from which records would be filtered in this example. Specify %AR% in Emp Name column to fetch the records where AR exists in Emp Name.